Every Monday on She.ology, we tackle a limiting mindset with word bullets of faith & courage. 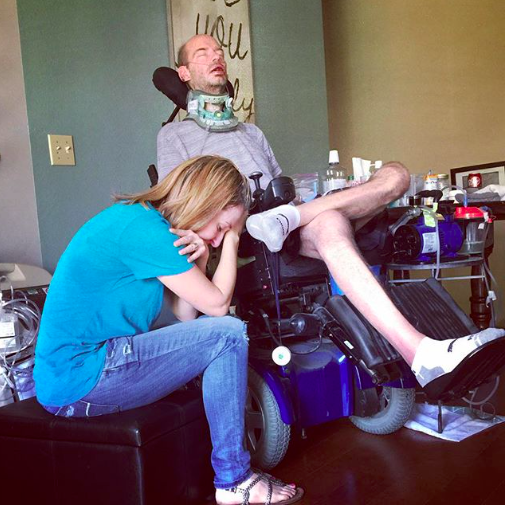 When my husband was diagnosed with ALS in 2010, I faced it fearlessly, with unshakeable faith in God and His ability to keep us from suffering. Kidding! I faced it from the fetal position while flooding my office floor with tears and sorrow and what if’s and why me’s. I would like to tell you I regret that response, but I really don’t, because I ended up crying myself right into the arms of Jesus. He met me in my suffering in ways I couldn’t have imagined from the safe shores of 2009. He met me and worked in me and changed me and challenged me and provided for me and grew my trust & confidence in His goodness by about a million percent. I don't know what you're facing today, but keep crying yourself into Jesus, trusting that He is using your suffering to make beauty grow wild on your battlefield. I only suspected this to be true because of Romans 5 - but through the four years of sickness and three years of widowhood, I have found it to be true in my very own life. I don’t believe God causes suffering, but I do feel certain He uses it - every bit of it, if we’ll let Him - to produce beauty in our lives. In me, He built new levels of compassion for others, a greater dependence on His care for us, freedom from fear over the small stuff (which had been nearly constant before), a new sense of courage for doing hard things and a heart for wild generosity. Beautiful things. Strong things. Not in exchange for my suffering - because I still feel the pain of losing Steve - but as a standalone treasure that makes my life continue to flourish abundantly though it seemed like it would shrivel up and die. I don’t know what suffering you’re facing today, but could I encourage you: Don’t waste it. Don’t let it define or diminish your growth or your beauty. Keep crying yourself into Jesus. Keep throwing yourself into His arms, trusting that He is working in your success and your suffering to make beauty grow wild on your battlefield. Suffering produces compassion for others. God is not surprised by my suffering, and if I let Him, He will use it to grow beauty in me. Suffering tethers me to the presence and care of God. How about your suffering? Do you believe it can be used for His glory and your good? Leave a comment to let us know what word bullet you will use this week to help you stay steady in spinning times. * You can read more about our journey with ALS at www.bostern.com - or in my book, Beautiful Battlefields.